Cardinal Gibbons High School is a college preparatory school of the Roman Catholic Diocese of Raleigh. We embrace the mission of Jesus Christ: to form men and women of faith, service and leadership in church and community. When you visit our campus, you are immediately engaged by an energetic, creative, spirited and loving school community, committed to welcoming each visitor and sharing our mission. 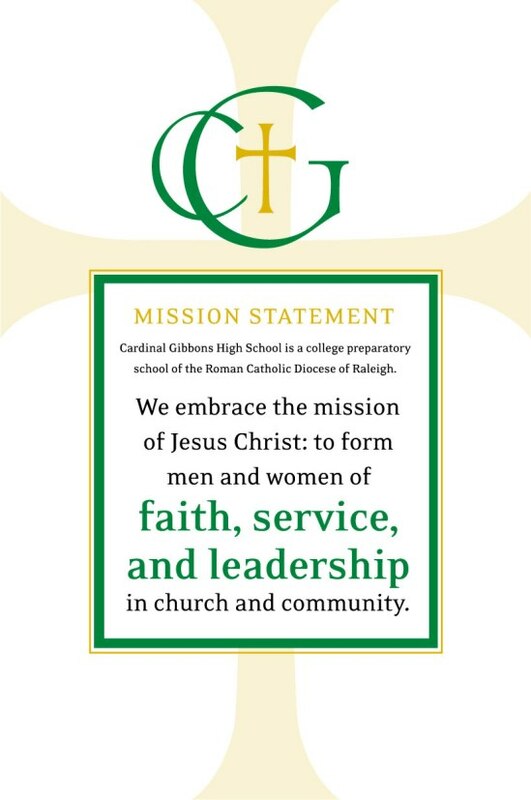 We hope that this website gives you a sense of the programs, activities and life of the school, and invite you to join us on campus to fully engage in the spirit of Cardinal Gibbons High School. Founded in 1909, Cardinal Gibbons High School is a Catholic school that prepares students for the modern college experience. We offer an outstanding college preparatory curriculum, guided by dedicated educators who are committed to challenging, supporting and encouraging our students. Our college counselors provide support throughout the four years, as well as guidance for the transition to college. Each Gibbons student is provided with a school laptop and supported through our STARs program, and students have full access to our Library Media Center before, during and after school. As a Catholic high school of the Diocese of Raleigh, we are deeply committed to the faith life of our school community. Our Spiritual Life program offers students the opportunity to attend and lead an off-campus retreat each year, participate in community service with their class, and attend all-school Mass. Students can also attend daily Mass in Queen of All Saints Chapel, receive the Sacrament of Reconciliation on campus and participate in our vocations program. Prayer is a consistent part of the Gibbons experience in classes, teams, and all school events. The Fine Arts programs offer students the opportunity to explore and grow their artistic gifts, and are an integral part of campus life so that students also learn to appreciate the beauty of the arts in their lives. We offer a full Arts curriculum including Visual Arts, Dance, Theater and Music, and Advanced Placement Courses in Music Theory, Visual Art and Art History. Our music offerings include Chorus, Strings, Guitar, Percussion and Band. Co-curricular opportunities include Pit Orchestra, Drumline, Jazz Band, and Drama Productions. Our nationally recognized Athletics program offers over 50 teams in 24 sports, including several Freshman-only teams. We were awarded the 2015-2016 North Carolina Exemplary School by the NCHSAA, and our teams have been some of the most successful programs in the history of NC high school athletics. Our students are supported by outstanding Sports Medicine and Strength and Conditioning programs, and we offer opportunities to pursue careers in both fields. The opportunity to serve and lead is offered by the myriad co-curricular activities including our dynamic Student Council, over 50 different student clubs, Gibbons Media including Video, Newspaper, Literary Magazine and Yearbook, iCUBE and Business Programs, and one-of-a-kind student events throughout the year. An essential part of the Cardinal Gibbons is the parent experience, and parents are invited to engage in the Gibbons mission by joining the CG Family Association, attending Parent Focus and educational programs, supporting the Cardinal Gibbons Fund, and of course, attending the many parent social events.